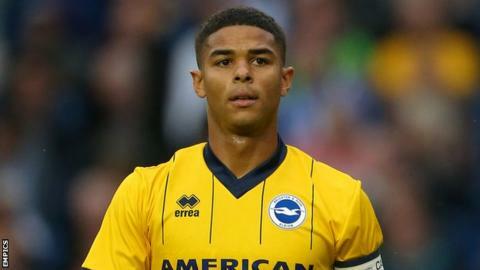 Brighton midfielder Liam Bridcutt has admitted it would be hard to turn down a move to a Premier League club. He has been linked with a move in the January transfer window to Sunderland where Gus Poyet, the manager who signed him for Brighton, is in charge. Bridcutt has made 145 appearances for the club and win his first cap for Scotland in March. "Without a doubt I've always said I want to be a Premier League player," the 24-year-old told BBC Sussex. "It would be even better if I can do it with Brighton, but if there is an opportunity for me to do it with another club I think it is going to be hard for me to turn it down." Bridcutt joined the Seagulls on a short-term deal in August 2010, but has since established himself as a key player and a fans' favourite. And despite his desire to play at the top level, he has reiterated his commitment to the club. "If you are doing well you will always get interest from other clubs. It is part and parcel of football really." He has been restricted to six appearances for Brighton this season following a three-month injury lay-off and his current aim to regain a regular place in the side. "For me, the hunger never goes because I always want to do the best I can and want to play as many games as I can," he added. "It has given me extra grit and determination to want it a bit more as I have been out for a long time and it has been hard for me sitting on the sidelines watching. "I can't wait to get a good run of games and see if we can progress."